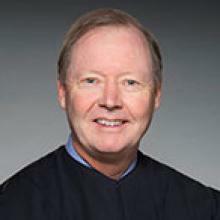 Justice Collins J. (C.J.) Seitz, Jr., was a widely respected attorney with more than three decades of legal experience before joining the Delaware Supreme Court in 2015. Justice Seitz is the founding partner of Seitz, Ross, Aronstam & Moritz LLP. In that capacity, he regularly litigated corporate, commercial, and intellectual property cases, and advised clients on issues of Delaware corporate law. Previously, Mr. Seitz served as managing partner of Connolly Bove Lodge & Hutz LLP, where he practiced for more than three decades. In addition to his work in the courtroom, Justice Seitz is actively involved in his community. He is a trustee for the New Castle Presbyterian Church, board member of the Friends of Hockessin Colored School #107, board member and former president of the Greater Hockessin Area Development Association, and board member and former president of Community Legal Aid Society. He a Bachelor of Arts from the University of Delaware in 1980. He earned his law degree at the Villanova University School of Law and was admitted to the Delaware Bar in 1983.